My existing HP 7520 printer has a mechanical problem. I was suggested to change to a new model - HP 7640. However, I have some ink stock at home. I was wondering if the HP 564 inks from my HP 7520 printer will fit the new HP 7640 printer? Unfortunately not. The HP Envy 7640 e-All-in-One printer can only use the HP 62 ink cartridges listed on this page, provided it was purchased in the UK. The HP Photosmart 7520 e-All-in-One printer uses the HP 364 / 364XL cartridges which are different. Furthermore, if your HP 7520 printer was using HP 564 ink cartridges this suggests that you have a non-UK version of the printer and none of the cartridges that we sell will work in your machine. Ink cartridges are numbered differently for different regions so you need to buy cartridges with the correct number for the region in which the printer was purchased. If your HP Envy 7640 printer was purchased outside of the UK then we recommend that you contact HP so they can advise you on which cartridge numbers are compatible and where you can buy these ink cartridges. Ideal for SOHO-users, the well-connected HP Envy 7640 e-All-in-One can print, copy, scan and fax. This model delivers vivid photo prints and laser-quality text documents. The Hewlett Packard Envy 7640 colour inkjet printer has a monthly duty cycle of 1,000 pages and can deliver prints at 14 ISO ppm for black and 9 ISO ppm for colour. It has dual paper trays and even has an automatic duplexer for double-sided printing. The stylish HP Envy 7640 e-All-in-One printer weighs 16.91lbs and measures 17.87 x 16.14 x 7.60 inches. This model has a 15-sheet photo tray and a 125-sheet paper tray. For connectivity, USB and Ethernet ports are offered as well as Wi-Fi. The HP Envy 7640 e-All-in-One has 128MB of memory and runs on a 525MHz processor. A flatbed scanner along with a 25-sheet automatic document feeder come as standard on the HP Envy 7640 printer. Its control panel has an indicator light for Wi-Fi, a power button and a touchscreen display. 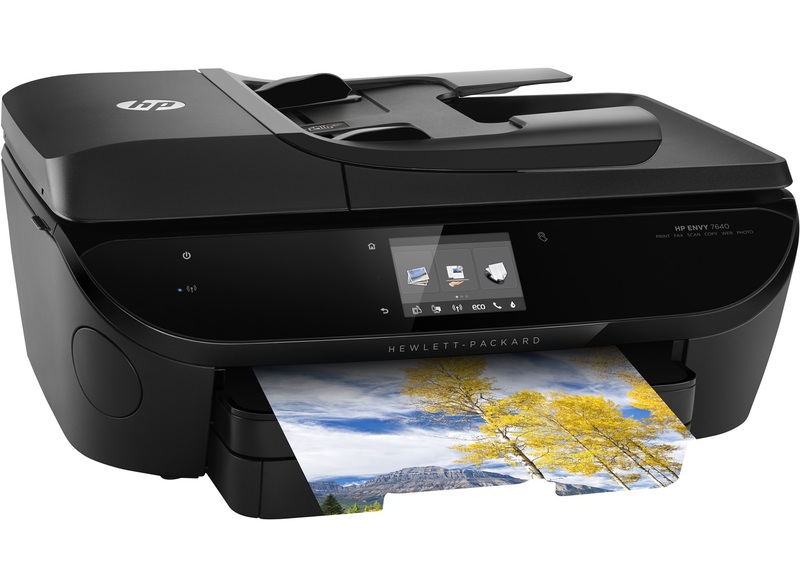 Multipole users can easily connect to the HP Envy 7640 all-in-one wireless inkjet printer as it has Wi-Fi and Ethernet. In fact, even without a router they can access the unit via Wi-Fi Direct. The Envy 7640 e-All-in-One inkjet printer supports cloud and mobile printing and even comes with web apps. For increased uptime, this model has an ADF and duplexer. The e-All-in-One HP Envy 7640 printer can use low cost HP 62 ink cartridges which are available to buy in a better value HP J3M80AE multipack for lower ink replacement costs. The HP 7640 Envy printer is quite slow when printing documents and photos. Even if it offered direct printing from tablets and smartphones, the Envy 7640 multifunction printer could also use a memory card slot or a PictBridge port for direct printing from digital cameras.